What is Sauce Labs ? Provides continuous testing with cloud support. It is one of the best cross-browser testing tool that provides both web and mobile application testing. It is a cloud-based testing that offers continuous testing on over 800 operating systems and browser combinations. It automates web application testing by using iOS simulators and android emulators. It offers live web testing that gives instant access to browsers and OS in cloud environment to debug applications and test corner cases. In addition, it also provides secure mobile application testing and supports test automation with automation frameworks such as Espresso and Appium. Moreover, it is an open source software that gives you full access to it’s source code. How much does Sauce Labs cost ? 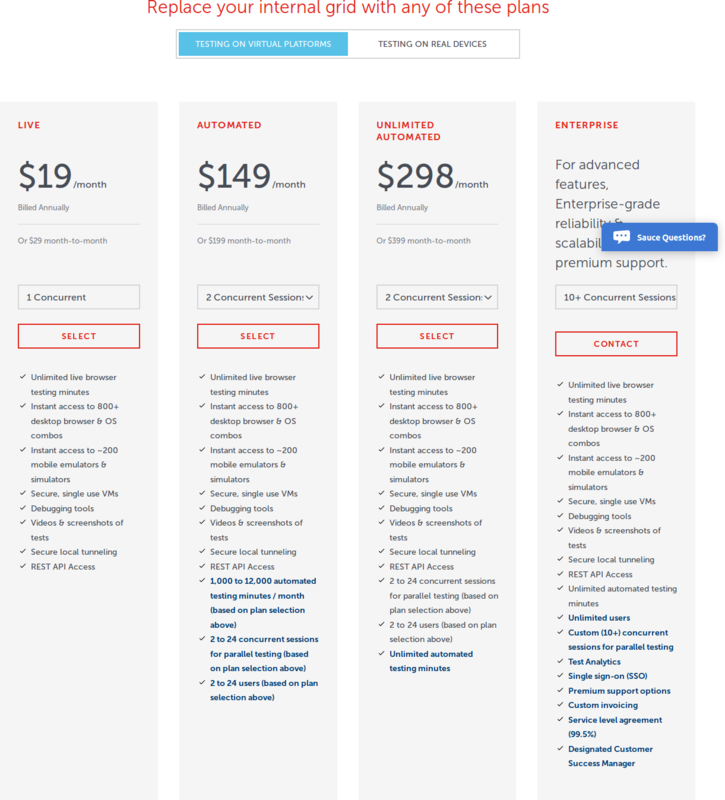 The pricing for Sauce Labs starts at $19.0 per month. Sauce Labs has 6 different plans such as - Virtual Platforms Live at $19.0 per month, Real Devices Live at $89.0 per month, Virtual Platforms Automated at $149.0 per month, Virtual Platform Unlimited Automated at $298.0 per month, Real Devices Automated at $349.0 per month and Real Devices Unlimited Automated at $600.0 per month. Sauce Labs also offers a custom plan based on the customer's request. For advanced features, Enterprise-grade reliability and scalability, and premium support. Please Contact the Vendor for the Detailed Pricing. Based upon the Number of Concurrent Devices the Pricing Values Differs.Please Contact the Vendor for Detailed Pricing. Based upon the number of Devices the Pricing Valued Differs.Please Contact the Vendor for Detailed Pricing. For private cloud option, Enterprise-grade reliability and scalability, and premium support. Based upon the number of Concurrent Session the Pricing value Differs.Please Contact the vendor for the Detailed Pricing. Disclaimer: The pricing details were last updated on 02/05/2018 from the vendor website and may be different from actual. Please confirm with the vendor website before purchasing. Pros: This platform offers one of the best solutions for integrating deep automated browser testing using the CI/CD pipeline. It also makes use of code management using version control mechanisms like GIT or TFS. It integrates best with Jenkins and makes creation of builds and setup really smooth that improves the automation capabilities. Test reports generation is pretty simple and easy to share. We can write and run tests parallely and automate them using simple coding mechanisms and commonly used programming languages. Cons: A really great platform and value for money, no major disadvantages noticed! "SauceLabs helps us to reduce the cost of running manual testing"
It has a variety of platforms and devices that we can choose from. The great thing is that SauceLabs support appium and mobile devices testing. We currently have some web product so testing the responsiveness is a must. And with Saucelabs, we have reduced the number and effort of manual testing by running the test on the cloud. I wish there is a mobile app for that for easier access. For sometimes we want to check the result immediately, we need to access the website on the phone browser. If there was a Saucelabs app like other out there, it would be a lot more convinient. You can always ask for a trial, and there support is really fast, just send them an email and get it back within an hour. I like very much the "test object" solution. It is very helpful to not have physical devices in the office, having the possibility to access to an online site to pick any device at any time. It is really amazing and help our team to be more productive, cheaper and faster. Sometimes the network speed is a bit poor... I think it is because we are in Argentina and it is a long distance between us. But it is really a bad point to all the South American customers. On the other hand, the support team replies are not very faster all the time. It's a good point to improve Saucelabs. We are solving the problem of automate a large manual regression tests without having physical devices in our office. We are so proud of choose Saucelabs as a partner in this way. Because it help us very much with our goal at a accesible price. "Easy and fast to integrate"
Easy and fast to integrate, Wide range of browsers and devices, Supports real device testing. 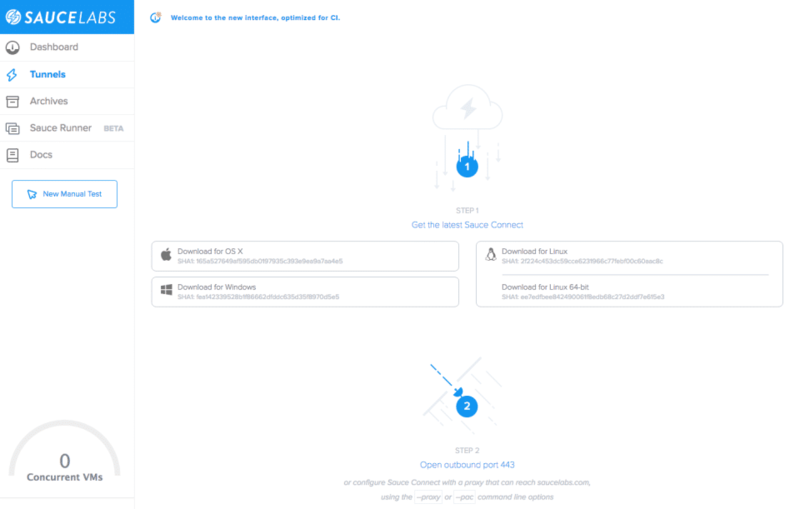 "Saucelab for real device testing"
"my experience testing with saucelabs"
I like the ease to run a lot of combinations of OS/browser/version when i'm testing web apps with selenium just calling selenium hub. Testing and automate tests in different browsers and operative systems is a hard and expensive task, because you have to install and the do all maintenance and updating work. When you need to trial the application, the trial accounts are very limited, without all OS and browsers available in the professional plans. I strongly recommend considering this tool if your need is to test web applications in different browsers, devices and operating systems. The characteristics of this platform solves very complex tasks in the field of testing. The biggest benefit of using saucelabs is the ease of running tests on any operating system, browser and browser version without worrying about the installation and maintenance work involved. It saves many problems and allows you to focus just on designing tests and executing them. In addition, there is a wide variety of operating systems, devices, browsers, browser versions available. Pros: In my organization this is the preferred solution for browser testing. No need to maintain our own infrastructure for testing. Saves the cost of real device purchase due to its emulators and simulators. Cons: Need to add more devices other than US and Europe for applications used worldwide. Overall: Extremely useful tool for testing purposes. Definitely recommended. The service is outstanding. They provide me with the combinations of browsers/platforms that make it easy for me to do my job. And I don't have to spend any of my time maintaining a lab! Lab maintenance is where I found I was spending a lot of time in previous jobs. One less thing to worry about now! I love being able to watch the videos, and to share the screenshots that the system takes for me. Sometimes it takes a little longer than a few days to get my support cases to closed. They used to be able to turn around support cases in a few hours, but now it's a little longer. It seems to me (anecdotally) that the time needed to get the tests running is a smidge longer. But I have not done anything besides mention this to support. Using Sauce labs just saves me time in the long run. "Sauce Labs in quality Engineering at Alaska Airlines"
Sauce Labs is great for providing varied mobile and web platform & versions to test against - this includes live and automated. This has been useful to our manual testers as well as some of our CI processes. Their support is also pretty good, I may not get the answer I want right away, but they do respond and are willing to work with me. We need to be able to ensure that our products work across a varied set of mobile and web platforms to support our business. We are able to to leverage internal and sauce labs servers with different versions of mobile and web to assist in this endeavor. So far, we're finding issues faster than waiting on manual testers checking browsers and validating against real devices in shop. 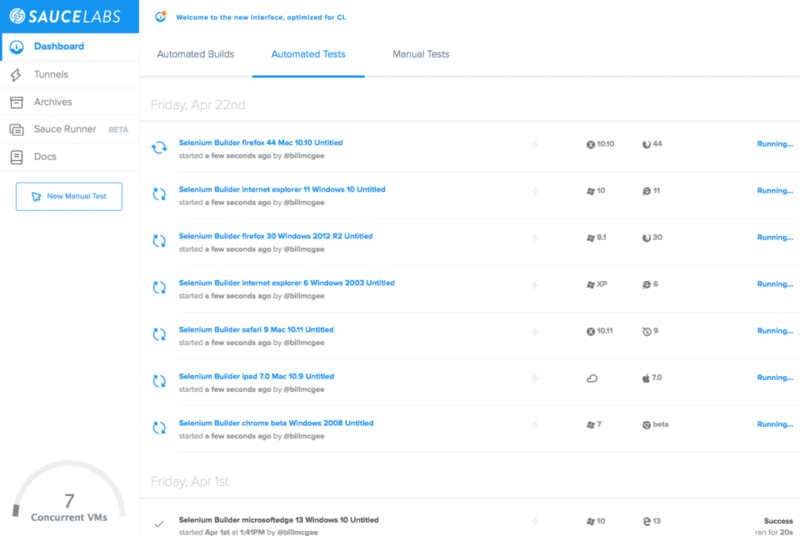 "Great service for web and mobile automated testing"
We have a lots of different device configurations we need to support and Saucelabs provides a great service for mobile and web automated testing requirements. There is, an intuitive and functional user interface and the service allows integration with our chosen continuous integration products. Occasionally there can be latency issues in which the saucelabs page takes too long to load. This can cause test automation issues and can be annoying. Great cloud based testing tooling for mobile and web with full integration with continuous integration tooling. Mobile and web automated testing across many device configurations and full integration with our continuous integration tooling. Which is the best automated testing software in terms of cross-browser compatibility? SauceLabs, Ranorex and BrowserStack are best in terms of cross-browser support.